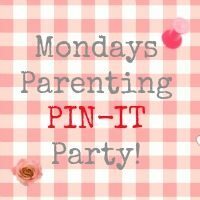 Come join our parenting pin it party now! We are back on the blog after a week off due to a Monday blog post traffic Jam! The lovely Cat, from Yellow Days, is our galmorous host this week, so do pop on over and discover which of these entries from last week she has chosen to include. Are you on Pinterest? If so, it’d be wonderful if you’d follow the Parenting Pin it Party board and the hosts. Leave your ID in the comments so we follow back. Leave your Pinterest ID in the comments too so we all find some new pinners to follow. Cat will love you forever if you pop her badge code in the relevant post too, so why not grab it from me? Next week’s host is The Fairy and The Frog! If you’d like to join in….then here you go, an this is a blog hop too, so grab the code if you want to take part yourself.